The EU summit, which ended during the night of 16 to 17 July, failed to choose the next EU foreign affairs chief to replace Catherine Ashton, and the next European Council President, to succeed Herman Van Rompuy. Leaders agreed to meet again on 30 August. EU leaders had come to the conclusion “since the afternoon” that there would be no decision on names. “We are not yet at the point where we can get a consensual solution on a full package of appointments. We will continue consultations,” said Herman Van Rompuy, the current European Council President whose term expires on 1 November. As the French President François Hollande put it, “‘We did not really discuss specific names” at the meeting. Eastern EU countries were the main reason for the blockage. They argued that no decision could be taken on the two senior positions before they knew what portfolios would be assigned to “their” national commissioners. German Chancellor Angela Merkel said EU leaders had suddenly realised there was “interdependence” between the distribution of Commission portfolios and the two offices. Jean-Claude Juncker, the Commission President-elect, has responsibility for assigning the 27 Commission portfolios within his team, with the exception of the EU foreign affairs chief, which straddles both the European Commission and Council of the EU. Nevertheless individual member states also have a say, Merkel said. In what appears to be a complex puzzle, EU leaders agreed to meet again at the end of August to agree on a “package” of appointments. In the meantime, each member country has been asked to put forward their candidate for the Commission. Gender representation does play a part in the overall decision, Merkel conceded. But she rejected suggestions that Germany could put forward a different candidate, saying Günther Oettinger, the current Energy Commissioner, was Berlin’s final choice. “I’m not going to add more to that,” Merkel said. Once Juncker has made a proposal on the distribution of portfolios, leaders will decide on the right persons to succeed to Ashton and Van Rompuy, she said. According to Merkel, one point that became clear at the meeting is that Ashton’s successor will need to come from the ranks of the Socialists and Democrats. French President François Hollande confirmed this, saying the job will go to a Socialist. Things are less clear regarding the European Council President, who must be “a person able to gather consensus,” Hollande said. Once a decision is made on the EU’s foreign affairs chief, male or female, everything else will fall into place quite quickly, Van Rompuy indicated. Hollande did not hide his preference for the Italian Foreign Minister, Federica Mogherini, to succeed Ashton, but he acknowledged there was no unanimity on her candidacy. In any case, the job will have to go to a woman, he stressed, as this corresponds to the image Europe wants to offer. “The Italian candidacy has my support, but we are seeking a common position,” Hollande said. The French President indicated that each country will nominate their commissioner-candidate before the end of the month, and that several names can be proposed. On 30 August the next foreign affairs chief and Council President will be decided, and possibly the Eurogroup President, although this is not a competence of the Council, he said. Responding to questions from journalists, Hollande denied suggestions that member states from the former Soviet bloc had placed a veto on Mogherini, who they see as too pro-Russian in the ongoing Ukraine conflict. There was no veto, he said. These countries simply wanted assurances that their commissioners will get significant portfolios, and a compromise needs to be found. While Paris has not formally announced its proposed candidate for the European Commission, sources close to the president told reporters, “You know our candidate, he was predesignated,” referring to the former finance minister Pierre Moscovici. Italian Prime Minister Matteo Renzi denied that his country had a pro-Russian policy in the context of the Ukrainian crisis. Italy follows the EU political line, he said. Anyone who puts Italy’s line in question puts in doubt the line of the EU, France, Germany and all other countries, Renzi stressed. 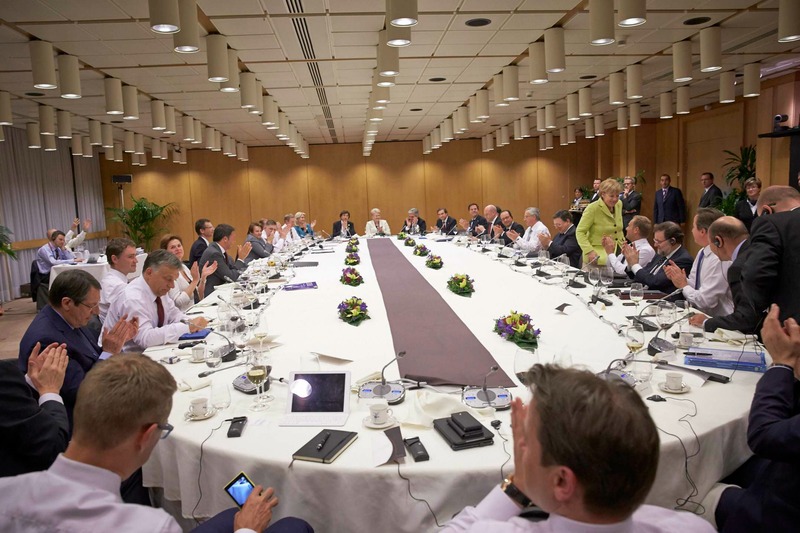 A day after the EU Parliament elected Jean-Claude Juncker to head the European Commission, the 28 EU leaders gathered in Brussels on Wednesday evening (16 July) to discuss who will become the next European Council President and EU's foreign affairs chief. Disliking a great nation is not a reason for being small-minded. The EU does not need a sexually-abused foreign minister. Work for the EU. Not against Russia, not for the US.